This weekend I took the chance to go on a little shopping spree to Ingolstadt Village, as they advertised a private sale with up to 40% off certain brands. 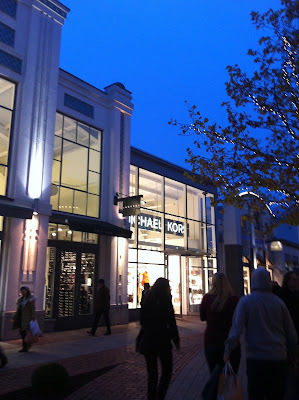 I was especially looking forward to Michael Kors and Stefanel for some cozy jumpers. Unfortunately Stefanel was already raided by some fashionistas the week before and the choices were a bit sparse. Still I found a lovely bright "Kenzo" green turtle neck jumper. Michael Kors was a bit disappointing, I quite liked the phone cases but the made the phone so bulky it was tough to access all the keys. Here are some impressions of the day: Doesnt it look beautiful with all the lights? I very much welcomed warming up at one of the new mulled wine and crepe huts they have set up- Great idea!